With the release of Captain Phillips tomorrow, the world will be privy to one of the finest performances Tom Hanks has ever given. When I first saw the film, I thought his work in it was so good that it would crack my Top 5 favorite Hanks performances, should I make such a list. 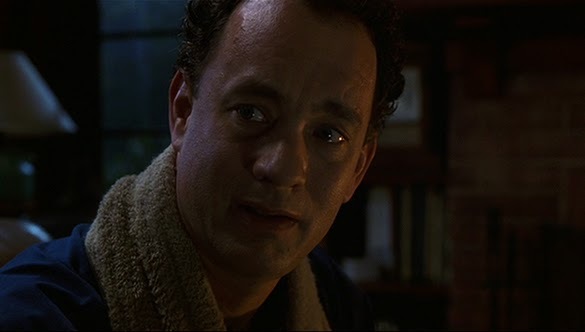 Indeed it has, along with four other flawless performances that help make Hanks one of the best actors there is. As mentioned in my recent review for Captain Phillips, the aspect of Hanks’ work in the film that I was immediately taken with was the fact that Phillips isn’t really a nice guy. He’s a worker. There to get the job done. And when his ship is hijacked, I loved that Phillips didn’t instinctually turn into a glad-hander, begging and pleading to be let go. He handled the situation with by-the-book precision, but he was never afraid to improvise in the name of safety. 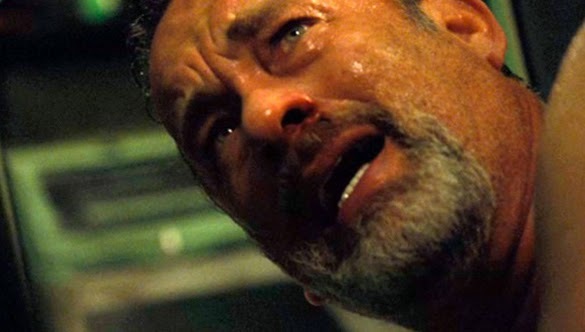 Based on the strength of the final scene of this film, we’ll be talking about Hanks’ work in Captain Phillips for a long, long time. I’m one of those people who loves Cast Away. All of Cast Away. Aside from the physical skill and emotional complexity it took to convincingly carry the middle portion of the film, I’m equally as taken with the gratified (if not borderline melancholic) sensibility of Hanks’ acting during the final scenes of the movie. Whether he’s fighting back tears in the home of his former lover, or describing a suicide attempt to his best friend, or standing at a crossroads, focusing on a path, wondering What If. I want to follow Chuck wherever he may go. It’s the way he pleasantly apologizes for Antonio Banderas in the hospital, the way he articulately tries to save his job in front of his bosses, the way he delicately handles a bigoted Denzel Washington during their initial meeting, the way he’s overcome with emotion after dictating an opera aloud, the way he triumphantly says “Yes” while showing lesions on his chest in court, and, of course, the way he stands helpless and lost outside of Washington’s law office. There are any number of things that make Hanks’ work as Andrew Beckett the most emotionally satisfying work he’s ever done. Just take your pick. I don't think there's any argument with that although my list is more different as I prefer Hanks the comedy actor than the dramatic one. 3. A League of Their Own "There's no crying in baseball!" I also think there should be a honorable mention for That Thing You Do! which I think is one of the most underrated yet enjoyable films of the 1990s. It had everything you want in a 60s rock n' roll movie as well as Hanks doing the supporting work and putting his friends in a film as well as Jonathan Demme making his lost-masterpiece Weekend at Party Pier. Those are excellent picks man, I had no idea you were such a fan of his comedy. I was close to splitting my 5th pick with Big, because I think he's excellent in that. That Thing You Do! is one of the most endlessly rewatchable films that exists. I love the hell out of it. So adorable. Great List! Hard to find any fault with any of the performances in it. Great to see Philadelphia getting the love. He was phenomenal in it though personally, I will probably go with SPR and Cast Away as 1-2. I might find some space for The Terminal as well. Not a great movie I agree but he was really great in it, I think. Thanks man! I really enjoyed him in The Terminal as well. Believable comedy and convincing drama in his acting there. Solid work. Great list! I'm still so torn on Captain Phillips. The movie itself doesn't look interesting to me, but everyone is raving about Tom Hanks' performance, so now I feel like I need to see it. And Cast Away...I never thought I'd cry over a volleyball. Thanks! Let me put it this way: if you are a fan of Tom Hanks as an actor at all, then you will appreciate Captain Phillips. Trust me. And poor Wilson... that damn ball knew how to get the tears rollin'. 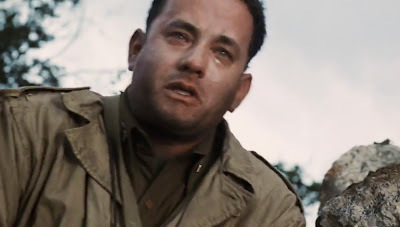 That Forrest Gump scene broke my heart. I don't think I have ever seen Cast Away, which is really weird. Must get onto it. Oh definitely, he's so good in Cast Away. People have issues with the film itself and fair enough, but there's no debating his brilliance. 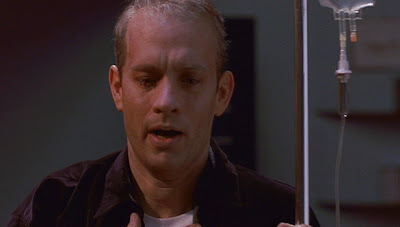 Great choices, Philadelphia really shows him in a powerhouse performance that is so moving. Hell yeah it does. Thanks so much for reading/commenting! I haven't seen Capt. Phillips of course but can't argue with your choices here Alex. I also loved him in Big and wholeheartedly agree with your shout-out for Cast Away. Exceptional performance. Glad you dug the picks! I LOVE him in Big. So really close to giving his work in Big the 5th spot. Great performance. I might tinker with the order, but I can't argue with what you have, other than the fact I haven't seen "Captain Phillips" yet. In that case, I'd stick in "A League of Their Own." He was awesome in that, as well. Great job! Love him in A League of Their Own. Who knew he could play a drunk prick so well, so early in his career? Hilarious. Be curious to hear what you think of Captain Phillips. 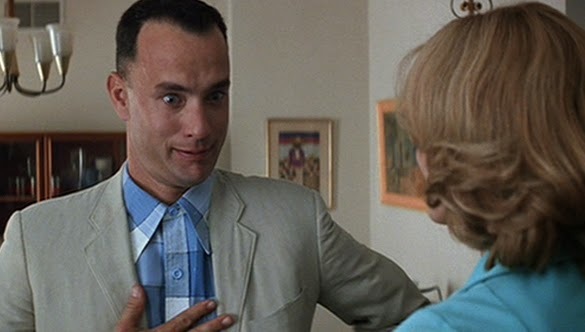 That scene in Gump always breaks me up. Amazing. I've never seen Philadelphia, crazy as that is, so the only thing if substitute is The Green Mile. He was the perfect choice to play Paul in that flick. Hanks always thrives at playing the awful hand he was been dealt. I do value his work in The Green Mile, for sure. He really carries that film well. If Gump breaks you up, you gotta see Philadelphia. He's remarkable. 5. Saving Private Ryan or Apollo 13 (both different, both as a good as the other IMO). Although I am partial to Turner and Hooch (such a cute movie). Great picks man. I LOVE Turner and Hooch. One of my favorite movies as a kid. When Hanks was on Inside the Actor's Studio, he admitted that the best acting partner he ever had was that dog, because he never had clue what the dog was going to do, so he had to improvise on every take. I loved that story. This is why I watch lists and don't make my own. I'm not sure I could narrow Tom Hanks down to five performances. Yeah man, tough picks here. Ten would've been too easy, so I was being hard on myself with cinco. Your English is good! And hey, you can leave a comment on this site anytime, no worries about translation! Love your picks. Big was really close to making my list. I love him in that movie. Grazie per l'arresto da e per i vostri commenti! Tough to go wrong with most Hanks performances, isn't it? I write this having yet to see Captain Phillips, but I can't wait, and as for Castaway.....you know, I was one of those people who originally had issues with the bookended parts. But as I've gotten older (wiser?) I've come to appreciate them a whole lot more. With each passing year, the more wistful I become about things I regret not doing or having had the chance to do and so the more I really get that end of Castaway. And Hanks' handling of that end part is so delicate. I still don't know that I can get onboard with the at the crossroads shot, but I can get onboard with the way Hanks plays it. One of my favorites Hanks performances might be Catch Me If You Can. I thought he did something interesting with what could have been a stock role. Also, I dug that story about you and your dad. I think you're spot on about the getting older/wiser thing. I find that's the case with me with a lot of movies. It's just about life experience, you know? I too love his work in Catch Me If You Can. He made an ordinary character unique. Great picks. Love seeing Phillips so high. That's awesome. Thanks man. Love your appreciation for Hanks. Philadelphia is most definitely a hard film to watch. It really does knock the wind out of me everytime. Also love the Cast Away love! I haven't seen Philadelphia in about 20 years. Maybe I should revisit it sometime. Must see Philadelphia now I guess! The best. So damn good. I probably should have included Saving Private Ryan, but I haven't seen in a while. I do remember his fine work, and the scene you mentioned is brilliant. Nice job! I remember your post, and I remembering loving Big at number one. I so wanted to include that one here. A great performance in a great film. I saw Captain Phillips last night, that final scene isn't just the best acting I've seen from Tom Hanks, but some of the best acting I've seen, period. Such a fantastic performance by Hanks, an actor who has begun to grate on me with his post-Big comedic roles, but he completely won me over. I'm definitely going to be on his Oscar bandwagon this year. 3. His work as Woody in the Toy Story franchise, some of the best v/o work I can think of, his reaction when Buzz shows up in the first one is brilliant. I love your love for Captain Phillips. That final scene was just astonishing. So cool that his role in that film tops your list. I don't really give voice work the amount of credit it deserves, but yes, he was incredible as Woody. Great call. I couldn't make a top 5 list for Hanks. I would have to go with 10, at least. I can't imagine ranking them, and I must confess I was a little taken aback when Forrest Gump only made it to No.5. Not having seen Cpt. Phillips, I can't really compare it to the others who make the cut, but once I scrolled down the list, I began to find no absurdity in your choices. He was the greatest male actor for a period of about 12 years. I mean, this is a guy who delivered, almost single-handedly, films of the caliber of Philadelphia, Forrest Gump, Apollo 13 (back to back if I might add), Cast Away, and the phenomenal voice work in Toy Story. Loved what you wrote about Forrest Gump. This is also my favorite moment of the film. I started with 10, but it was frankly a little too easy. I always try to challenge myself, so 5 made it much more difficult. I agree, he was the best for a great number of years. Can't wait to hear that you think of Captain Phillips. Love the list and agree with you on all the performances, though I might have had Gump first. With that said, I do want to mention his completely underated performance in Joe Versus the Volcano. I'm not suprised no one else has mentioned it since it is a cult classic kind of film, but it is one of my favorite films of all time and defiantly my favorite Hanks film. So yeah, just thought I would throw a shout out about a wonderful film incase y'all haven't seen it yet. Hey man, thanks so much for stopping by and commenting. Joe Versus is a very spirited pick. I haven't seen that one in years, but I remember liking it more than most everyone else. Good call there! Hey! Thanks for responding. I'm glad you feel that way about JVTV. Not alot of people get that film or see the messages, but I know now that you do. Cheers! Hell yeah man, solid film there!